We have contributed to dozens of books, and have authored several of our own. Published by Rocky Mountain Books in 2018 – 7 x 10” hardcover book, 184 pages, 125 photos. 40 years in the making, the book Searching For Tao Canyon chronicles in razor-sharp Kodachrome images and text a decade’s worth of exploration in the subterranean world of the American desert, long before it was Instagrammed to global fame. In the early 1970s, Canadian photographer Art Twomey stumbled across a narrow crack in the desert floor in northern Arizona. It was a slot canyon, a stone crevasse carved by water and wind. From the rim, he could make out only deep shadows. But from within, having climbed into it, he found an intricate underground fantasy of shape, light, and color that defied ordinary perception. The photographs he made that day, when published, caused a small sensation in the world of landscape photography, and sent him and co-authors Pat Morrow and Jeremy Schmidt on a decade-long search for the ultimate slot canyon. They called it Tao (meaning simply “The Way” in Chinese) and thought of it more as an archetype than an actual place — an idealized canyon of the mind. At the time, slots were virtually unknown, their exquisite beauties not yet appreciated. There were no guidebooks, no guided tours, no publicly available satellite images to reveal the locations of these hidden places. Their pursuit was driven by the thrill of discovery, of finding places no one knew and inadvertently becoming forerunners in the sport of technical canyoneering. In all the years of having their enigmatic canyon photos published in magazines and books worldwide, the authors used pseudonyms for each canyon in order to protect the delicate fluted sandstone features that drew them there in the first place. Searching for Tao Canyon continues that policy. It is not a guidebook. It gives no directions; names no names. And for good reason. On a recent return visit to the Southwest, Morrow and Schmidt visited some of their old haunts. Many are still wild and unchanged, but one in particular has become a world-famous commercial attraction, drawing a “line dance” of awe-struck visitors every day for nine months of the year. Demand is so strong that the number is capped at 2500 per day, and reservations must be made far in advance. The book is dedicated to Art Twomey, who first introduced Morrow and Schmidt to canyon country and the slots. Twomey died in 1997. With this book, the authors hope to build appreciation not for any particular places, but for what the untamed nature of canyon country can teach us, and the need for the public, who find it so alluring, to do everything possible to protect it. “The degree of change we’ve seen in the region since 1975 is astonishing,” says Schmidt. “Canyon country and canyoneering have become popular beyond anything we might have imagined 40 years ago. We’ve watched that process with mixed feelings, taking some reassurance that much of the region is in protected status of one kind or another — national parks, monuments, wilderness areas, the Navajo reservation, and more. Now, the government-sanctioned attack on national monuments including Bears Ears and Grand Staircase by mining, oil and gas interests warns us that this supposed protection is perilously fragile. See it at Bungalo Books. Shop for it at iTunes. For the past three decades, we have been inexorably drawn to the ancient mountain people at the heart and on the fringes of the lofty Tibetan Plateau. The enduring spirit of Tibetan Buddhists, marked by a reverence for nature and passivity, has gained a toehold wherever we have wandered. The Tibetans’ robust culture was forged in their vertiginous landscape and we have visited them often for respite from the frenetic pace of western society. During those travels, we also discovered the rich diversity of the region’s other cultures, from Shimshali shepherds in the Karakoram range of northern Pakistan to Lepcha farmers in the lush foothills of Mt Kanchenjunga. In 2014, Banff’s Whyte Museum of the Canadian Rockies invited us to assemble an exhibit of our Himalayan imagery. This multi-touch “coffee tablet” ebook grew out of that exhibit. Focusing more on photos than on the written word, it is part personal photo album, part exposition and part celebration interspersed with random bits of diary entries and passages borrowed from books and magazine articles we have written on the topic. With these photographs, we share our wonder and admiration of the people who live at the heart of the Himalaya. 170 photos, three video clips, including “Hockey Night In Ladakh”, an audience favourite on the Banff Mountain Film Festival World Tour in 2005-2006. This richly illustrated adventure ebook (for the iPad only) tells the gripping story of two Canadian climbing expeditions that captured the attention of the mountaineering world in 1982 and 1986 – written by two climbers who reached Everest’s summit in distinctly different ways. 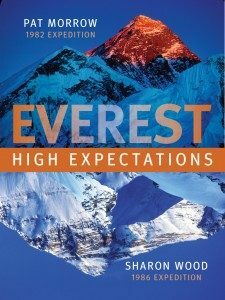 Combining a powerful yet intimately told story with 150 colour photos, maps, archival video and audio recordings, “Everest: High Expectations” sets a new standard for illustrated books as it chronicles both Canadian expeditions’ quest to put a new route up the world’s highest peak. This is one of the world’s first major ebooks developed exclusively for the iPad, using Apple’s new iBook Author software. Packed with 50,000 words, 140 hi-resolution photographs, slide shows, archival video and audio clips, maps and resources, all in 142 pages. The Apple iPad brings them to life. Find your link to the book on iTunes here. This book, co-written by international adventure photojournalist Pat Morrow and alpine guide Sharon Wood, provides a fascinating insiders’ look at an era when climbing with style was more important than “peak bagging” and Everest was only approached after a long mountain-climbing apprenticeship. “High Expectations” delivers classic high-altitude drama – a near miss in a massive avalanche, speedy alpine-style ascents from the South Col to summit, a risky nighttime descent of the Hornbein Couloir, a fiery gas explosion in a tent and weeks battling jet stream winds in an atmosphere starved of oxygen. Published books – shipping info at bottom of page. Raincoast Books, 154 pages, 47 colour photos, 9 historic Sella b&w photos, reinforced soft cover. ISBN 1-55192-226-6. $28.95 US/CDN. Hey, guess what? There are other mountains besides Everest! A hundred years ago, British climber Douglas Freshfield and Italian mountain photographer Vittorio Sella became the first Europeans to circumambulate an 8000 meter peak. In seven weeks, they trekked around Mt Kangchenjunja, the third highest mountain in the world. A century later, Pat and Baiba set out to trace their footsteps and explore the hidden corners of Sikkim and eastern Nepal. To add some mountaineering interest, they attempted to climb the lovely 6887m peak, Mt Siniolchu. Describes Pat’s global climbing spree, and the pain-staking logistics that went into climbing the highest peak on all seven continents. Useful information in text, captions and route maps for those who want to climb all Seven Summits themselves. A collaboration of four Canadian photographers: Pat Morrow, Janis Kraulis, Greg Stott, and Ron Watts. A collection of our favourite adventure-related photos and extensive anecdotal text on the philosophical and technical considerations that went into taking those photos. The photos range from a frosty shot of Sir Edmund Hillary toasting Neil Armstrong at the North Pole to a star-streaked time exposure of Ayers Rock. 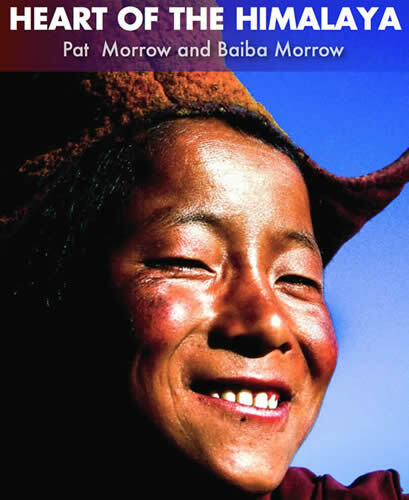 Seven Months in the High Country of Tibet, Nepal, China, India and Pakistan.The Mountaineers, 336 pgs, 50 colour photos, soft cover, ISBN 0-89886-343-0; hard cover ISBN 0-89886-262-0.
by Jeremy Schmidt, photographs by Pat Morrow. This tale follows 4 friends on a 10,000 km epic journey in 1987 on bike, truck and foot around the Himalayas. Lots of great ideas for planning your own visit to this area. Winner of The Mountaineers’ First Barbara Savage/Miles From Nowhere Memorial Award. Firefly, 128 pgs, 125 colour photos, reinforced soft cover, ISBN 1-55209-108-2. $24.95 US/CDN. Published in 1997 to commemorate the centennial of the Klondike Gold Rush, this book offers a pictorial celebration of Canada’s northern wilderness and the people who live there. Good coverage of Yukon’s diverse regions: from the lofty summit of Canada’s highest peak, Mt. Logan, to several rivers, including the Tatshenshini, Alsek, Snake and Firth, to favourite tourist destinations like Dawson City and Kluane Lake. Finalist in the 1997 Banff Mountain Book Festival. In a survey released by the Canadian Bookseller’s Association September 1, 1999, this book was at the top of the Canadian Bestseller’s List, and remained in the top 5 for several weeks. Payment must be by certified cheque or money order made out to Morrow Productions and should include the appropriate Shipping and Handling charges, as per below. For those ordering from outside Canada, payment must be in US funds. Payment must be received before the order is filled. Please include your name, address, and telephone number with your order. If you’d like a special inscription in any of the books, please include that request with your order. Charges per book for postage and handling: If you are ordering more than one book, please contact us for the appropriate postage charges. All books will be mailed through Canada Post unless otherwise specified. NOTE: Both the Beyond Everest and Adventures in Photography are now out of print, so you are tapping into the books’ last supply.